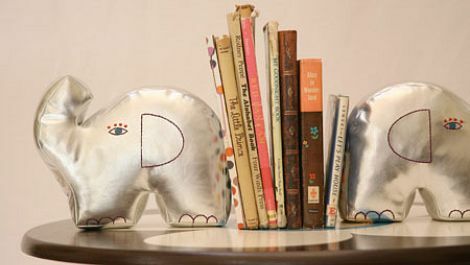 i am just a skinch miffed at seeing these glamorous/cute elephant bookends from zid zid kids in my reader, because now i think i need to do an elephant post. until that comes along, please enjoy this pair. they’re filled with polyfill to satisfy any stuffie cravings, and also with sand, so they should be able to get the job done in a child’s library. i think they’re super little sculptures, in addition to being functional. find them for $64 and see the rest of zid zid’s fabulous kid’s line at design public. cool! could elephants be the new owl? ooh — i hope so! not that i don’t love owls. i do love ALL the things in their line, but especially these elephants. they have a smart and whimsical point of view.